The rain is making a soft pitter-patter against the window. 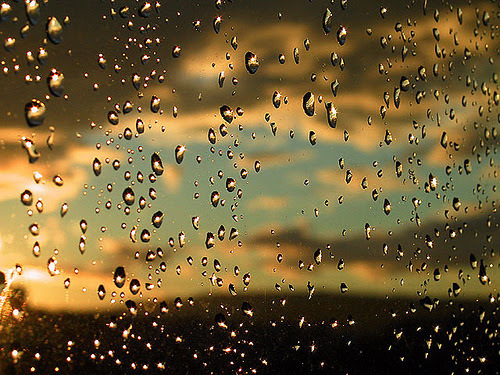 Each drop clears a trail through the dusty pane and then falls to the ground. Birds are happily chirping as they dip their wings into puddles of water and let it roll off their backs. Damp, cool air blows through the window and dances across the back of my neck bringing tiny goose bumps to the surface of my skin. A lawn mower hums in the distance and children are laughing loudly in the park nearby. But I don’t hear or feel any of this. I am in dreamland. Tucked in between the sheets, my hibernating brain sees visions of the past and present intertwined in colors and shapes. I breathe deeply as the breeze continues to float around me. I am lost in time and space and the lovely distractions outside do not stir me. It’s raining. I’m sleeping. It’s dreamy.